Before you upload your paperback manuscript and cover to KDP, you'll choose your ink and paper type, trim size, bleed setting, and cover finish. If your paperback is printed with black ink, you can choose cream or white paper. For paperbacks with color ink, you can choose white paper, which shows a higher contrast for images and graphics. For example, you're publishing a textbook with lots of images, tables, and charts. White paper will make these visual elements more striking. Select "color ink" if any images in your paperback are supposed to print in color. Set up a separate paperback on your Bookshelf if you have a black-and-white and color version of your book. Remember that the cost for paperbacks printed in color is higher. Paper type doesn't affect printing costs. Environmental consciousness is important to us. As a manufacture on-demand company, we produce units only as they're ordered, which reduces excess production. Our ink is chlorine-free, and our acid-free interior paper stock is supplied by a Forest Stewardship Council-certified provider. We currently offer a cream paper for black and white book interiors that is made from 30% post-consumer waste recycled material. We also maintain a commitment to recycling waste materials resulting from the printing process and from daily office operations, and we will continue to review our practices to ensure we are doing our part to protect the environment. You can choose from a variety of trim sizes (see the table below for a list of sizes, as well as mininum and maximum page count by size). The most common trim size for paperbacks in the U.S. is 6" x 9" (15.24 x 22.86 cm). When setting up your book, this is the default in the "Print Options" section of the Paperback Content tab. If you want a different trim size, click "Select a different size" and choose from standard and non-standard trim sizes. You can also enter your own custom trim size. If you want to enable Expanded Distribution for your book (this can help you reach more readers through bookstores, online retailers, libraries, and academic institutions), it has to meet our trim size eligibility requirements. Books with "bleed" have elements (e.g., images) that extend to the edge of the page. Accounting for bleed is important because it prevents a white border from appearing at the edge of the page when the book is trimmed. If your book has bleed, add 0.125" (3 mm) to the page width and 0.25" (6 mm) to the page height. For example, if your trim size is 6" x 9" (15.24 x 22.86 cm), set the page size to 6.125" x 9.25" (15.54 x 23.46 cm). 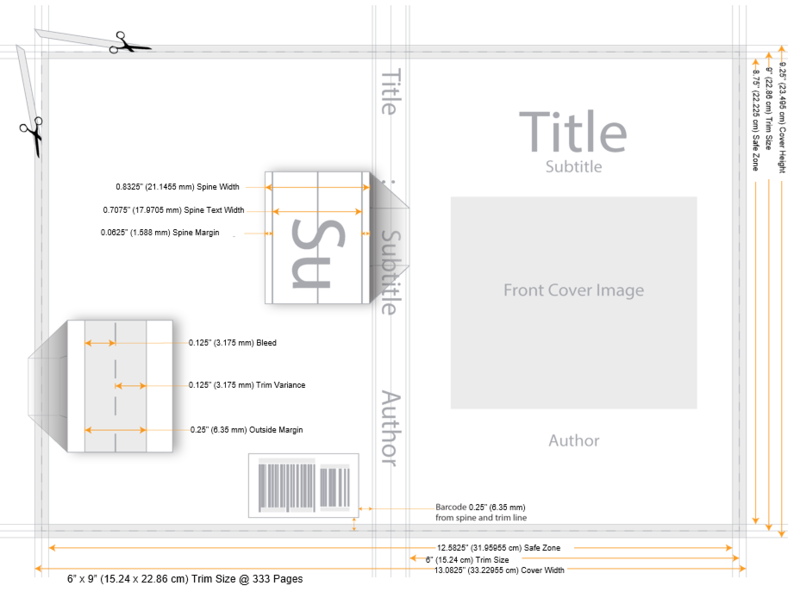 See the images below for the layout of the book in this example. For help calculating your book dimensions, try our calculator. If your book has bleed, you need to set your interior to bleed when you choose your print options during title setup. Also, bleed is only supported for fixed-format files like print-ready PDFs. Changing the bleed settings won't change the printing cost. Glossy finish is shiny. It makes black covers darker and artwork more striking. It's typical for textbooks, children's books, and nonfiction. Matte finish has minimal sheen and a subtle, polished look. It's typical for novels and other fiction.